Prolonged usage of medical devices results in adverse factors including wearing out of these devices, rise in infections, development of microbes, and increase in friction and corrosion. In order to counter these adverse effects, medical devices are coated. Different types of surface-coating technologies have been implemented in the recent past. These have helped reduce design complexity and have improved the overall usage of medical devices. Based on product, the global wound care and medical device coatings market has been segmented into antimicrobial, hydrophilic, drug-eluting, and antithrombogenic & others. Antimicrobial is the most widely used product type of wound care and medical device coatings. The segment is likely to dominate the global wound care and medical device coatings market during the forecast period, due to high demand for antimicrobial coatings for use in the health care industry. Antimicrobial coatings have low cost and high compatibility with various materials of medical devices including metal, plastics, carbon fiber, composite materials, and stainless steel. Antimicrobial coatings resist the formation of microbial growth on the coating substrate. On the other hand, hydrophilic is estimated to be a rapidly expanding segment of the wound care and medical device coatings market during the forecast period. Hydrophilic coatings are gaining significance, as they provide sufficient wetting ability to facilitate smooth lubrication. Cardiovascular devices is likely to be the rapidly expanding application segment of the market during the forecast period. In terms of application, the global wound care and medical device coatings market can be segmented into wound care (medical tapes & bandages and wound drains) and medical devices (general surgery devices, cardiovascular devices, neurology devices, gynecology devices, orthopedic devices, dentistry, and others). Medical devices is estimated to be the dominant segment of the wound care and medical device coatings market during the forecast period. Rising health care expenditure, technological advancements, growing elderly population, and increasing prevalence of chronic diseases are driving the market. Wound care is projected to be the rapidly expanding segment of the wound care and medical device coatings market from 2018 to 2026. This is attributable to rapid growth of geriatric population, development of innovative wound care products, increasing number of road accidents and trauma injuries worldwide, and rising number of awareness programs for wound care treatment and management. Medical tapes & bandages is expected to be the dominant sub-segment of the wound care segment, whereas wound drains is likely to be the rapidly expanding segment during the forecast period. Based on region, the global wound care and medical device coatings market can be classified into North America, Europe, Asia Pacific, Middle East & Africa, and Latin America. North America dominates the global market, due to favorable health care policies and rising frequency of cardiometabolic disorders such as pulmonary embolism (PE) and deep vein thrombosis (DVT) in the region. High adoption of advanced surgical treatments, increasing awareness regarding commercially available products, and development of health care infrastructure in the U.S. are likely to fuel the market in the region between 2018 and 2026. Europe constitutes the second-largest share of the global market for wound care and medical device coatings. However, the market in the region is expected to witness sluggish growth during the forecast period, due to stringent regulations imposed by the European Union. The market for wound care and medical device coatings in Asia Pacific is anticipated to witness rapid growth during the forecast period. Rising demand for coatings in cardiovascular devices and dentistry segments is likely to fuel the market in the region in the next few years. 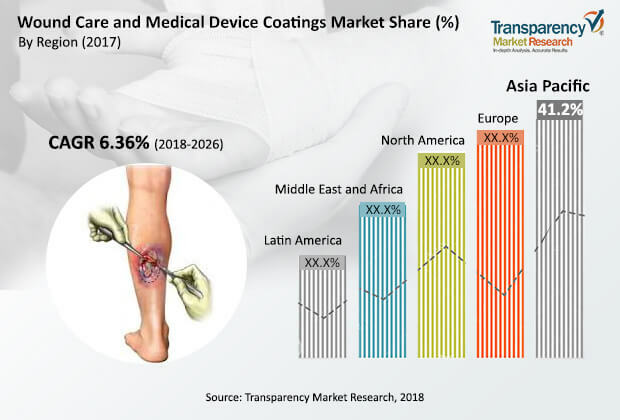 China, India, and Southeast Asia are expected to dominate the wound care and medical device coatings market in Asia Pacific in the near future. Increase in awareness about health care and rise in elderly population in Brazil are projected to boost the demand for wound care and medical device coatings in Rest of World from 2018 to 2026. Furthermore, cardiovascular devices and neurology devices segments are estimated to provide lucrative opportunities to the wound care and medical device coatings market during the forecast period. The global wound care and medical device coatings market witnesses’ high degree of competition among market players. The market is dominated by large players which are technologically advanced. They account for a major share of the global market. The wound care and medical device coatings market is capital intensive and technology intensive. Some of the key players operating in the global wound care and medical device coatings market include Surmodics, Inc., Royal DSM, Hydromer Inc., Covalon Technologies Ltd., AST Products, Inc., Abbott, and Precision Coating Company, Inc. Prolonged usage of medical devices results in adverse factors including wearing out of these devices, rise in infections, development of microbes, and increase in friction and corrosion. In order to counter these adverse effects, medical devices are coated. Different products of surface-coating technologies have been implemented in the recent past. These have helped reduce design complexity and have improved the overall usage of medical devices. Based on product, the global wound care and medical device coatings market has been segmented into antimicrobial, hydrophilic, drug-eluting, and antithrombogenic & others. Antimicrobial is the most widely used product type of wound care and medical device coatings. The segment is likely to dominate the global wound care and medical device coatings market during the forecast period, due to high demand for antimicrobial coatings for use in the health care industry. Antimicrobial coatings have low cost and high compatibility with various materials of medical devices including metal, plastics, carbon fiber, composite materials, and stainless steel. Antimicrobial coatings resist the formation of microbial growth on the coating substrate. On the other hand, hydrophilic is estimated to be a rapidly expanding segment of the wound care and medical device coatings market during the forecast period. Hydrophilic coatings are gaining importance, as they provide sufficient wetting ability to facilitate smooth lubrication. Cardiovascular devices is likely to be the rapidly expanding application segment of the medical device coatings market during the forecast period. In terms of application, the global wound care and medical device coatings market can be segmented into wound care (medical tapes & bandages and wound drains) and medical devices (general surgery devices, cardiovascular devices, neurology devices, gynecology devices, orthopedic devices, dentistry, and others). Medical devices is estimated to be the dominant segment of the wound care and medical device coatings market during the forecast period. Increasing health care expenditure, technological advancements, growing elderly population, and increasing prevalence of chronic diseases are driving the market. Wound care is projected to be the rapidly expanding segment of the wound care and medical device coatings market from 2018 to 2026. This is attributable to rapid growth of geriatric population, development of innovative wound care products, increasing number of road accidents and trauma injuries worldwide, and rising number of awareness programs for wound care treatment and management. Medical tapes & bandages is expected to be the dominant sub-segment of the wound care segment, whereas wound drains is likely to be the rapidly expanding segment during the forecast period. Based on region, the global wound care and medical device coatings market can be divided into North America, Europe, Asia Pacific, Middle East & Africa, and Latin America. North America dominates the global market, owing to favorable health care policies and rising frequency of cardiometabolic disorders such as pulmonary embolism (PE) and deep vein thrombosis (DVT) in the region. High adoption of advanced surgical treatments, increasing awareness regarding commercially available products, and development of health care infrastructure in the U.S. are likely to fuel the market in the region between 2018 and 2026. Europe constitutes the second-largest share of the global market for wound care and medical device coatings. However, the market in the region is expected to witness sluggish growth during the forecast period, due to stringent regulations imposed by the European Union. The market for wound care and medical device coatings in Asia Pacific is anticipated to witness rapid growth during the forecast period. Rising demand for coatings in cardiovascular devices and dentistry segments is likely to fuel the market in the region in the next few years. China, India, and Southeast Asia are expected to dominate the wound care and medical device coatings market in Asia Pacific in the near future. Increase in awareness about health care and rise in elderly population in Brazil are projected to boost the demand for wound care and medical device coatings in Rest of World from 2018 to 2026. Furthermore, cardiovascular devices and neurology devices segments are estimated to present lucrative opportunities to the wound care and medical device coatings market during the forecast period. The report analyzes and forecasts the wound care and medical device coatings market at the global and regional levels. The market has been projected in terms of volume (kilo tons) and revenue (US$ Mn) for the period from 2018 to 2026. The study includes drivers and restraints of the global wound care and medical device coatings market. It also covers the expected impact of these drivers and restraints on the demand for wound care and medical device coatings during the forecast period. The report also highlights growth opportunities for the wound care and medical device coatings market at the global and regional levels. The report comprises detailed value chain analysis, which provides a comprehensive view of the global wound care and medical device coatings market. Porter’s five forces model for the wound care and medical device coatings market has also been included to help understand the competition landscape. The study encompasses market attractiveness analysis, wherein product segments and application segments have been benchmarked based on their market size, growth rate, and general attractiveness. The study provides a decisive view of the global wound care and medical device coatings market by segmenting it in terms of product, application, and region. These segments have been analyzed based on present and future trends. Regional segmentation includes current and future demand for wound care and medical device coatings in North America, Europe, Asia Pacific, Latin America, and Middle East & Africa. The report also covers individual product segments and application segments of the market in all regions. The study includes profiles of major companies operating in the global wound care and medical device coatings market. Key players profiled in the report are Surmodics, Inc., Royal DSM, Hydromer Inc., Covalon Technologies Ltd., AST Products, Inc., Abbott, and Precision Coating Company, Inc. Market players have been profiled in terms of company overview, business strategies, and recent developments. The report provides the estimated market size of the global wound care and medical device coatings market for 2017 and forecast for the next nine years. The size of the global market has been provided in terms of revenue. Market numbers have been estimated based on product, application and regional segments. The market size and forecast for each product segment and application segment have been provided for the global and regional markets.